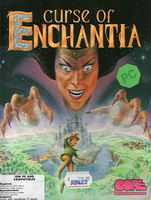 A good example of the "good concept butchered by poor execution" syndrome, Curse of Enchantia's only feature that is worth mentioning is the fact that it was one of the first CD-ROM adventure games ever released (although it took little advantage of 640MB storage, adding only a longer animated introduction than the floppy version). Way back in 1992, the game was bundled with many first CD-ROM drives, but its real use as a coaster will become apparent soon after one installs the game. The plot isn't half bad - it's a typical hero-boy-kills-an-evil-witch story, which as Roberta Williams has proven can make successful games. The game, however, has a VERY awkward interface - picking and using items require a lot of clicks, for one thing, and you'll be tired of clicking after a few screens. This, combined with grainy graphics and poorly written dialogues, more than ensure that the game would remain unseen from the eyes of most players. If you want to play a decent adventure from the house that Lara Croft made, try Universe instead. Proceed at your own risk.